Arkane's secret project has finally been unveiled. 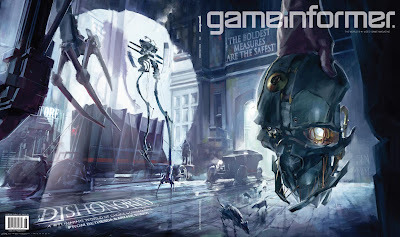 GameInformer's cover story for August will feature DISHONORED, the first person scifi/fantasy stealth/action game. Arkane Studios and founder Raf Colantonio have made memorable games in the past (Arx Fatalis, Dark Messiah of Might & Magic) that ultimately suffered from a lack of publisher support. Bethesda Softworks believes in their vision and is giving them all the time, money, and development help (regular meetings with guys like The Elder Scrolls' Todd Howard don't make your game worse) they need. Harvey Smith, one of the main minds behind the first two Deus Ex games and a legendary veteran of game development, shares the vision and is on board as Dishonored's co-creative director along with Colantonio. Viktor Antonov designed Half-Life 2's iconic City 17 and is lending his talents to Dishonored's world. This is a perfect storm for creating a game that shatters the mold that first-person action games have built for themselves in the mainstream. We've seen the game running, and now we share Colantonio and Smith's vision too. Dishonored is the antithesis of a edge-of-your-seat roller-coaster ride. It's a game about assassination where you don't have to kill anyone. It's a game about infiltration where you can set up traps and slaughter the entire garrison of an aristocrat's mansion rather than sneak in. It's a game about brutal violence where you can slip in and out of a fortified barracks with nobody ever knowing you were there. It's a game about morality and player choice where the world you create is based on your actions, not navigating conversation trees.